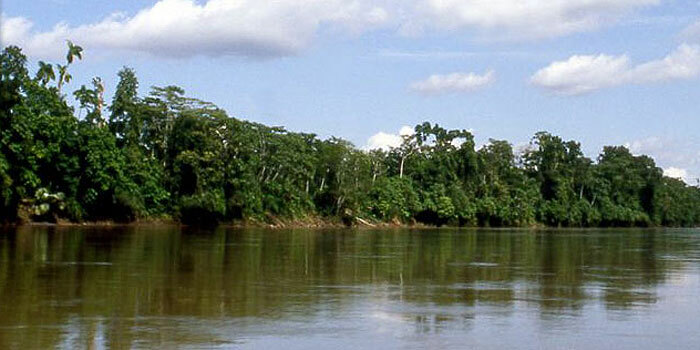 The Sacha jungle lodge is located in the province of Sucumbios, in the Northeastern part of Ecuador. A 40-minute flight will take you from Quito to Coca. Then you travel by motorized dugout canoe for 2 hours (approximately) down the Napo River, after which a 30 minute walk will get you to the lodge. The lodge is located in a very nice setting surrounded by primary forest. 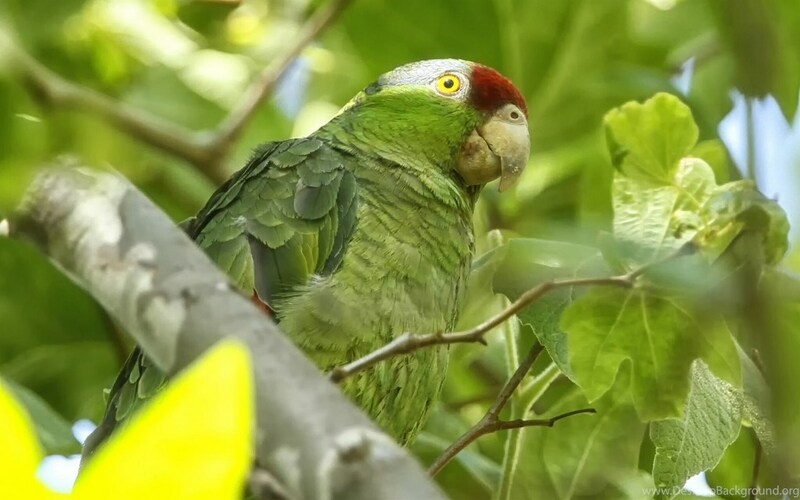 The Sacha tour program consists of a combination of jungle walks on narrow trails – through different types of forests (Primary, Secondary, Varzea etc.) – and canoe rides on local lakes and rivers. In addition, an observation tower and the recently finished 275 meters long canopy walkway enables visitors to climb 36 mts. 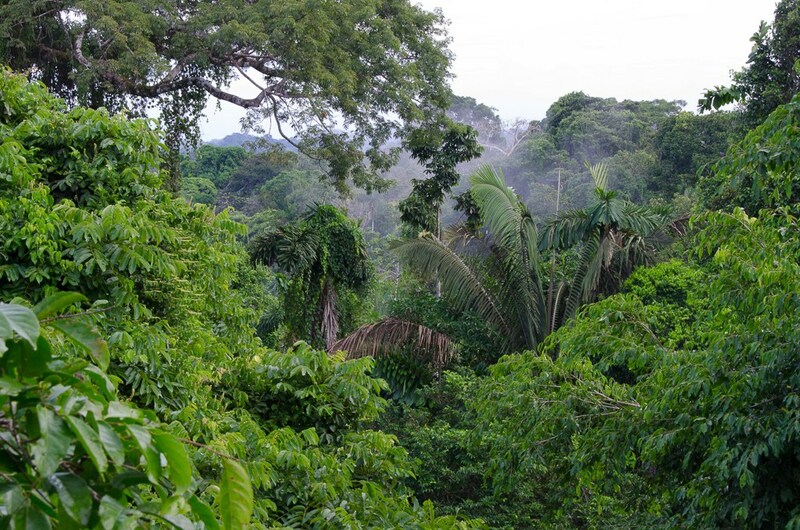 into the canopy for an unobstructed view of intact rainforest, as well as a possible close-up view of mammals, plants and dozens of species of birds. Groups of 5 to 8 people at the most will be formed and led by an English/Spanish speaking naturalist guide plus a local native guide. 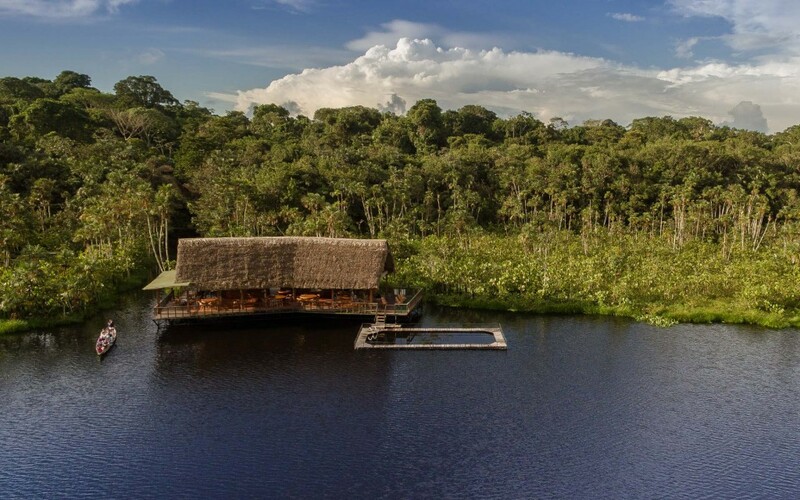 At the Sacha lodge in Ecuador you will find comfortable accommodations in rustic cabins of native design that blend in with the surrounding rainforest. At the same time, you will be provided with the comforts you would expect of a first class hotel: modern bathrooms with hot running water, screened rooms with a magnificent view of the rainforest; bottled water free of-charge; and excellent, international cuisine that incorporates the delicious tropical fruits of the region. Upon arrival to Coca you will be greeted for airport reception and enjoy a brief lunch in Sacha’s private house before beginning your transfer to the Sacha Lodge. Boarding a covered motorized canoe, you will enjoy a two hour transfer down the Napo River. Disembarking the canoe, the staff at the Sacha Lodge will assist with your luggage as you enjoy an easy, 30-minute walk through the densely flooded palm forest. Following the raised boardwalk you will reach the Pilchicocha Lake, a remote black-water lake where dugout canoes await to carry you further into the Amazon Jungle. As you cross the lake, the cries of tropical birds will serenade you as you reach the Sacha Lodge. 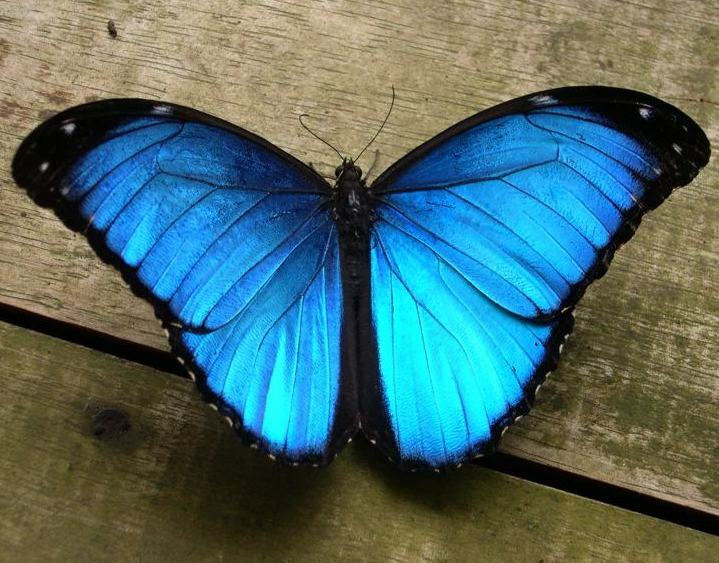 Later this afternoon you can chose to return to Pilchicocha Lake to enjoy a refreshing swim; visit the bird observation tower to view the several species of birds common around the lodge, and enjoy the sunset; or visit the butterfly house to view the many beautiful colors of the various butterfly species. This morning you will wake early to enjoy breakfast and begin your morning activity, starting at approximately 6:00AM. Following the Liana Chica trail for one mile you will arrive at the canopy walk, a self-standing rigid suspension canopy walk that will allow you to observe the spectacular views of the rainforest canopy and the many colorful and exotic birds and mammals that can be found high above the ground floor. The canopy walkway is 36-meters high and 275-meters long, with two of the three towers offering observation decks every 12-meter. 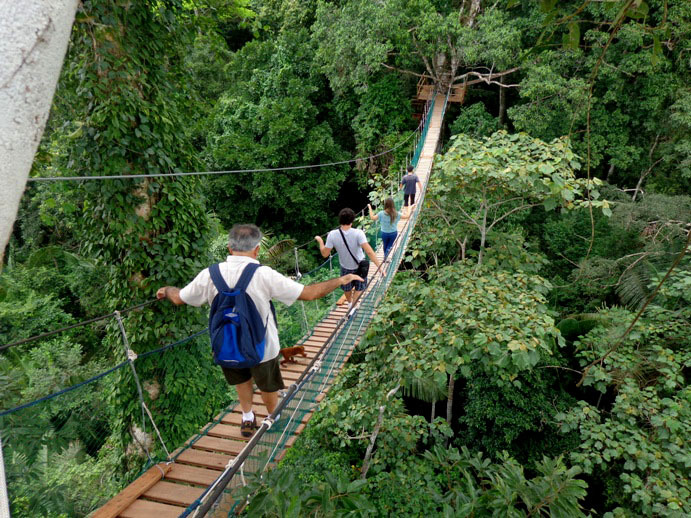 Descending from the thrilling canopy walk, you will follow the Liana Grande trail through the terra firma and igapo forest habitats as your native guides explain the various flora species that can be used for medicinal purposes. As the trail turns into the Higueron trail, you will be led through a pristine primary forest where large Kapok and fig trees tower hundreds of feet over your head. After lunch, you may choose to enjoy a leisurely hike along the Rio Napo, or choose a slightly more challenging hike along the Leoncillo trail where the elusive Titi monkey hides. Both trails will lead you back to the main boardwalk for your final trek and canoe ride back to the Sacha Lodge. This morning after breakfast you will follow the Lagartococha trail, hiking to the Lagartococha Lake. As you walk you will learn more from your naturalist guides of the native people of this region, and their deep relationship with the surrounding ecosystem. 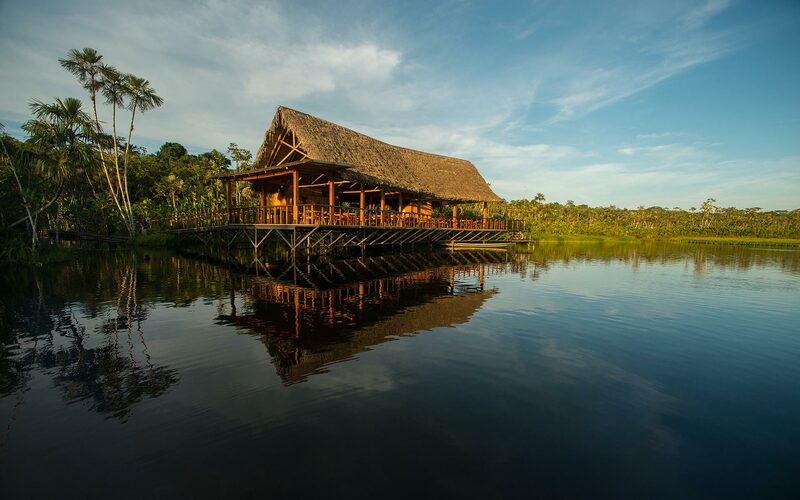 Arriving at Lagartococha Lake, enjoy a tranquil canoe ride across the swamp that is home to anacondas, caimans and capybaras. Reaching the other side, you might be able to spot playful squirrel monkeys jumping through the trees. Returning to the lodge, you will enjoy the remainder of the morning at your leisure. This afternoon, following lunch, enjoy a fishing excursion for the infamous razor-toothed piranha. 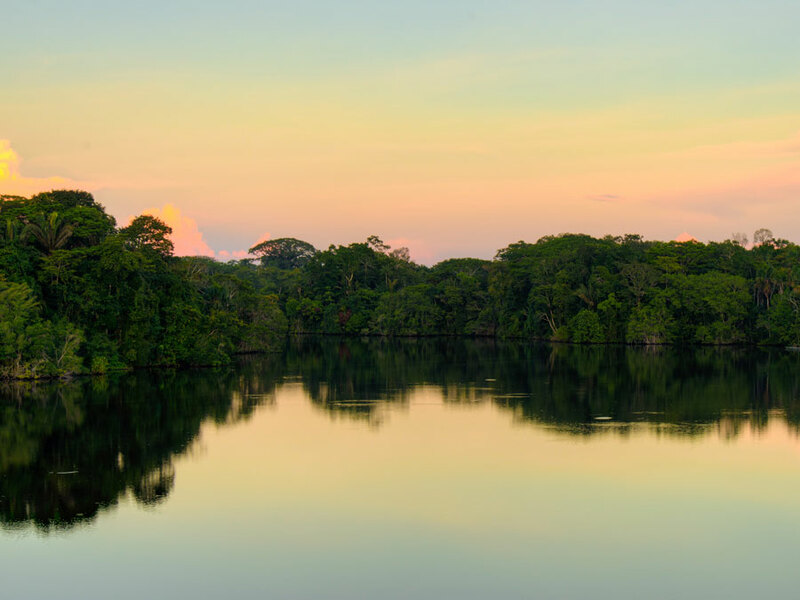 Following time to fish, you will enjoy a canoe ride through he flooded Amazonian forest. While you glide along the water, keep your eyes peeled to the trees in search of the elusive three-toed sloth, and squirrel, capuchin and howler monkeys. As your canoe ride comes to an end, you will reach Sacha’s 135-foot wooden tower, built around an old Kapok tree. Climbing to the top you will be able to enjoy views of the vibrantly colored birds and watch as the sunsets over this amazing ecosystem. Each of the 26 cabins comfortably accommodates singles, doubles, and triples (upon request). You will also have a private bathroom with hot water. The ceiling fans circulate air through the screened in, eco-friendly rooms, and the hammocks are a great spot to relax in the whispered ambience of the Sacha reserve. The dining area includes a full bar. During your stay, you will enjoy an international and local menu that will satisfy any palate. You will also have the chance to enjoy a barbecue in the al fresco dining area. Occasionally due to circumstances out of our control, the Sacha Lodge may not be available at the time of booking. In these circumstances when Sacha Lodge is unavailable, South America Tours will provide the best possible alternative. Beverages, personal expenses, activities outside the lodge, and other items not mentioned above are not included. (SharedGuide) = Meet other likeminded travellers and share the services of a guide / vehicle during the plan activity. Typical group size is 10 travellers which really works well and makes for a fun experience for all. CALL 1300 787 987 FOR BOOKING INFORMATION ABOUT OUR AMAZON - SACHA JUNGLE TOUR!